The Trump Organization CEO Donald J. Trump and Irongate principals Jason Grosfeld and Adam Fisher have announced the development of a luxury hotel-condominium, part of Outrigger Enterprises' Waikiki Beach Walk project. Trump International Hotel and Tower Waikiki Beach Walk, at Saratoga and Kalia roads, will include a 350-foot tower with approximately 460 luxury hotel-condominium units ranging from approximately 500 to 3,000 square feet. The building will consist of approximately 775,000 gross square feet and will include four stories of parking and 6,500 square feet of dining and retail space. The building's lavish appointments will include a library, wine cellar, lobby bar, cafe, outdoor swimming pool, sun terrace with ocean views, indoor/outdoor dining and bar area, cabanas with tropical landscaping and views of the ocean and neighboring Fort DeRussy park, a private fitness center and spa, and separate residential and hotel lobbies. "The addition of this luxury development to Waikiki Beach Walk is a testament to the attraction of our city as one of the world's most celebrated destinations. We are delighted to welcome Mr. Trump and Irongate, whose shared vision will only further strengthen the drawing power of Waikiki," said Honolulu Mayor Mufi Hannemann. "We are honored to work with Donald Trump and his organization to create the finest luxury experience in Waikiki, with stunning views of the world's most famous beaches and gorgeous amenities. I want to thank Mayor Hannemann and Outrigger for their efforts to create an environment where Trump Tower is possible," said Jason Grosfeld, co-founder of Los Angeles-based Irongate. "Trump Tower will be the most luxurious development in one of the most recognized resort destinations in the world today -- Waikiki Beach," said Trump. 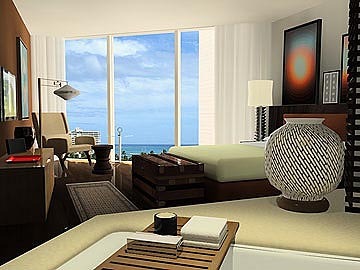 "My partners and I look forward to setting a new standard for luxury in Waikiki." The lobby will be an extravagant two-story structure with sprawling ocean views and will be attended by round-the-clock concierge service. Trump Tower will pamper guests and residents with 24-hour room service, valet and porter service. Outrigger Enterprises, the master developer of Waikiki Beach Walk, sold the development rights for the Trump Tower site to Irongate last year, and the two companies are working together to make the overall development of Waikiki Beach Walk a resounding success. "We are proud to welcome Trump Tower to the exceptional Waikiki Beach Walk project, which will soon bring more energy than ever to the heart of Waikiki," said David Carey, president and chief executive officer of Outrigger Enterprises. "As the last word in luxury, this project will send a message that the world's favorite resort is also a world-class place to live and play," added Carey. Trump International Hotel and Tower Waikiki Beach Walk is being designed by the Manhattan, New York-based Guerin-Glass Architects in conjunction with Benjamin Woo Architects of Honolulu. Brett Hill Management will manage the design and construction of the project as project manager.